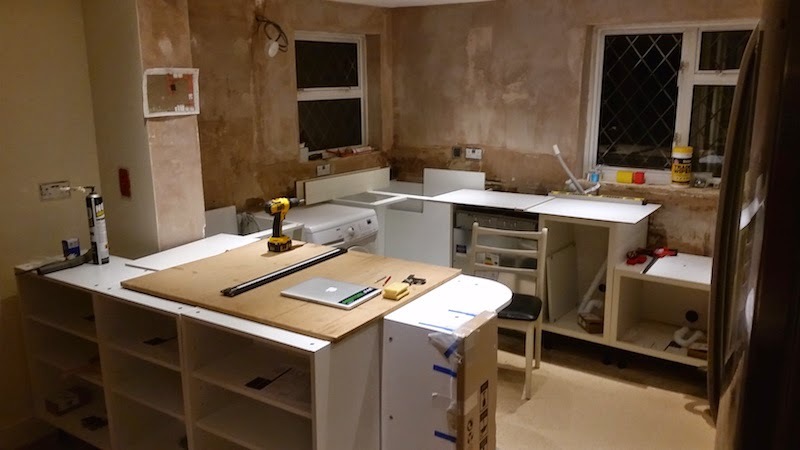 I'm assuming you've read the first part of the kitchen make over, if not you can find it HERE. 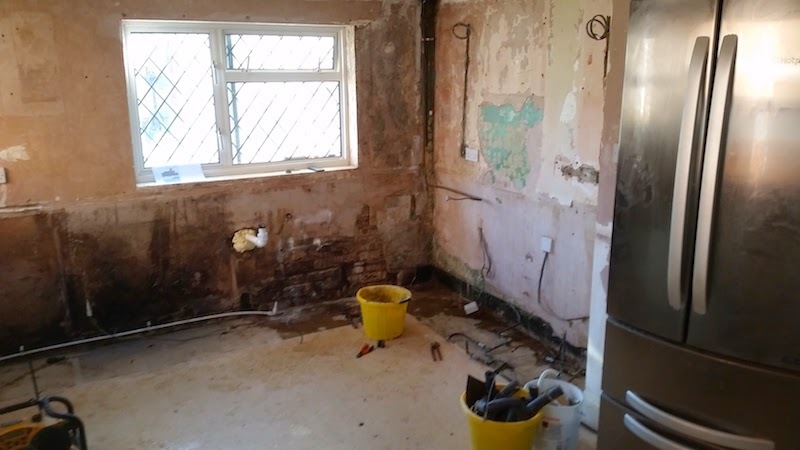 So with the delivery date set, the first half of the room decorated, it was time to remove the old kitchen. I decided to leave it as late as possible before the delivery so we had a cooker and sink up to the last possible day. Even though I knew there was likely to be a lot of work to do on the walls behind the old units. 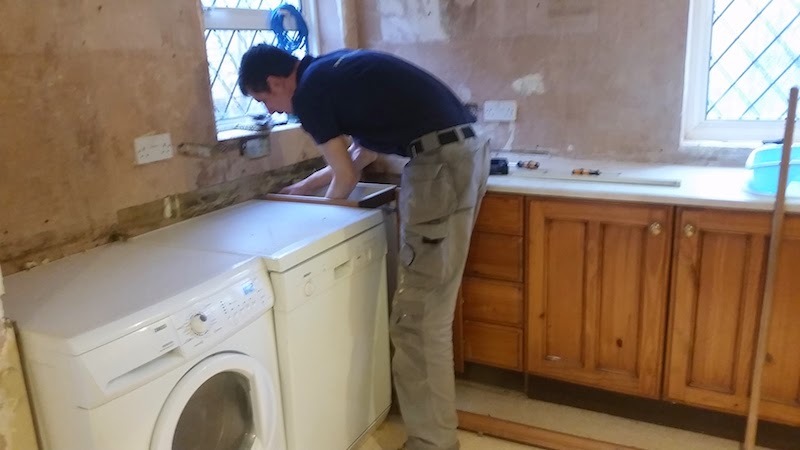 It's pretty easy removing the old stuff, just a case of being methodical and taking your time, I decided to completely dismantle each unit "back to flat-pal status" as this meant less room taken up with waste, and made it easier for disposal. With the sink and hob removed the state of the original work became clear. 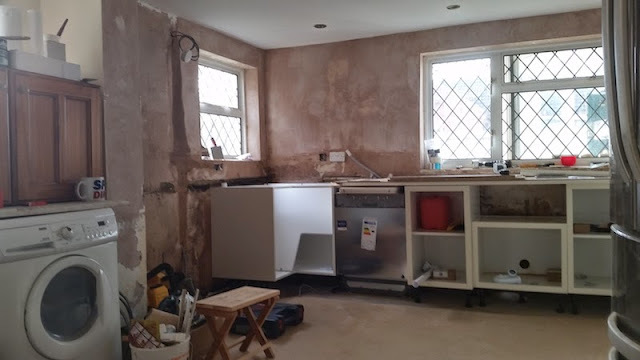 Here the you can see the old sink waste pipe in the wall and the feed for the hob. Not so clear because of the colour of the pipes against the walls, are the mess of old water pipes that needed to be tidied up. It looked like the old windows screen saver from C.1995! 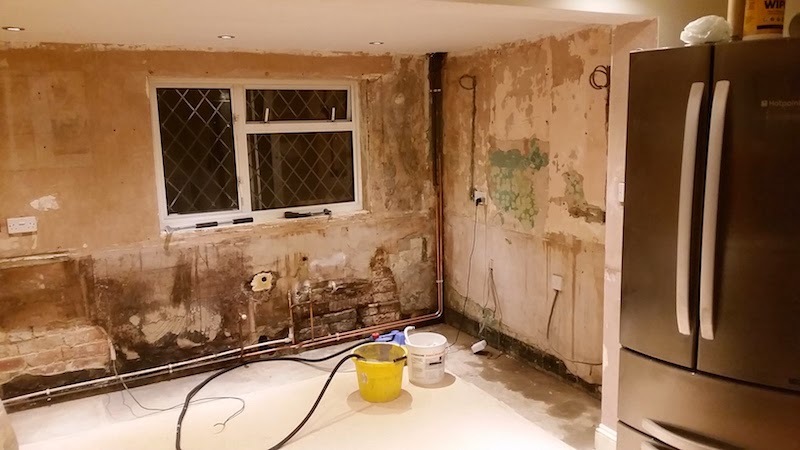 All new water pipes, I got a mate who's a plumber in to help with the this, as although I understand the theory of simple plumbing, and I can solder a joint, it was far quicker and safer! to get his help and experience to task. I'm super paranoid about leaking pipes due to the damage that can be caused by a dodgy joint, so playing it safe was the obvious route for this. You can see new shiny copper pipes in place - NO PUSH-FIT's HERE! :-) Took him about an hour, and had the water back on for a brew in double quick time. Notice also how need and simple it all is. All I had to do was drill three holes through the walls for the waste pipes for sink, dishwasher and washing machine. We also move the outside tap to a more suitable location. 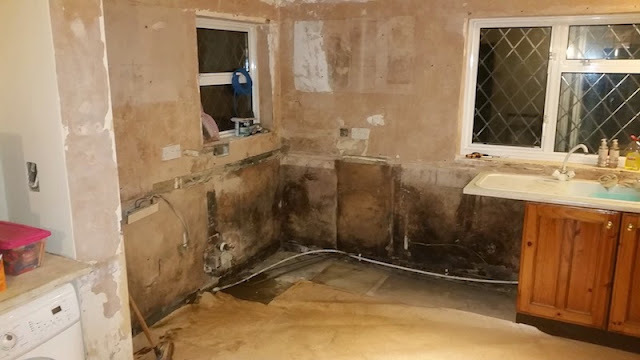 As with plumbing, electrics are another area I steer clear of, and I would recommend to everyone to do the same! I can change a simple light fitting and rewire a plug, but this was rather more in depth, so again, a mate who I worked with on a previous job got ropped in to lead a hand. 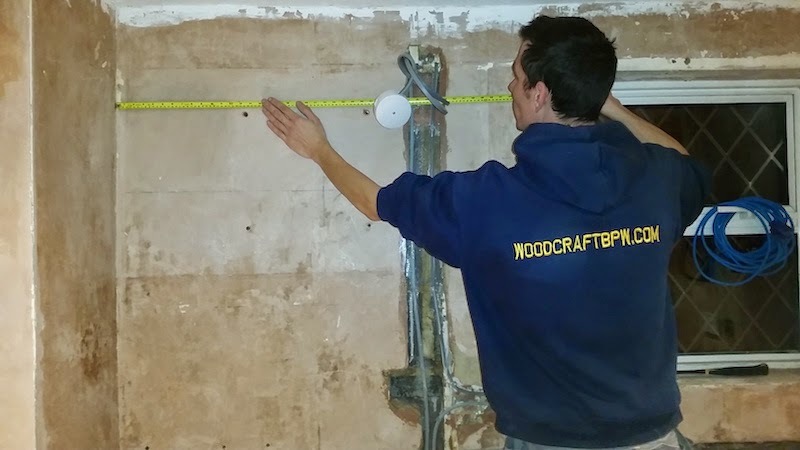 This wall has a cupboard in place so I wanted to measure where the cables were incase I needed to drill into the walls later on. Once plastered over I would only roughly know the locations, and so needed a pretty accurate location. With everything out, the walls plastered, holes for services drilled it was time for the delivery. 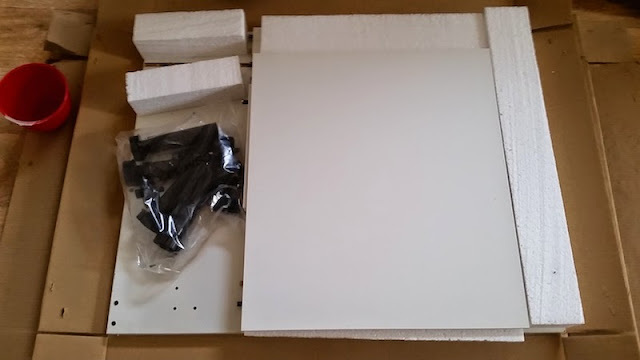 I didn't take lots of pictures of flat pack assembly, simply because it's easy. All you need to do is be methodical, tidy and DO READ THE INSTRUCTIONS!! I'm the worlds worst for it, and I know many of use are, but really DO READ THEM! there will be bits that you get the wrong way round, and it's all in these details, several times I had to start again because I skipped a step or put something in backwards so the next part didn't line up. The main reason for taking this photo was the inclusion of the plastic feet that come in the box with each cabinet. The company we bought the kitchen through added on £2.50 PER PAIR of feet for each unit, with added up to about £80! We decided to leave these off the order, knowing I could get them for £1 a pair elsewhere. These were ordered and shipped before the kitchen was delivered, and inside each unit box - the feet required! This meant the cost of everything could really have added up had we just picked the kitchen and had it delivered. You would never even know it if the company had fitted it to! 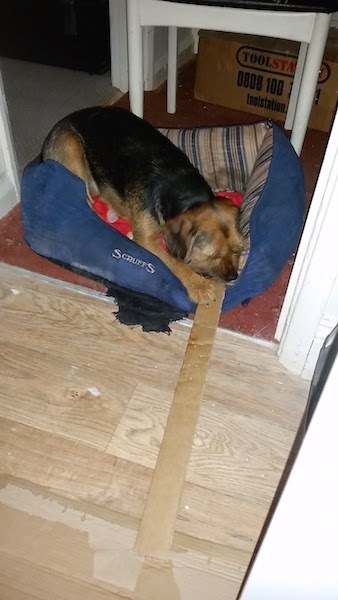 At least somebody was happy with all the cardboard that started to appear - "just helping to keep it tidy!" Here's most of the base units in, again it's just a matter of getting your height, and methodically going round keeping your level as you go. 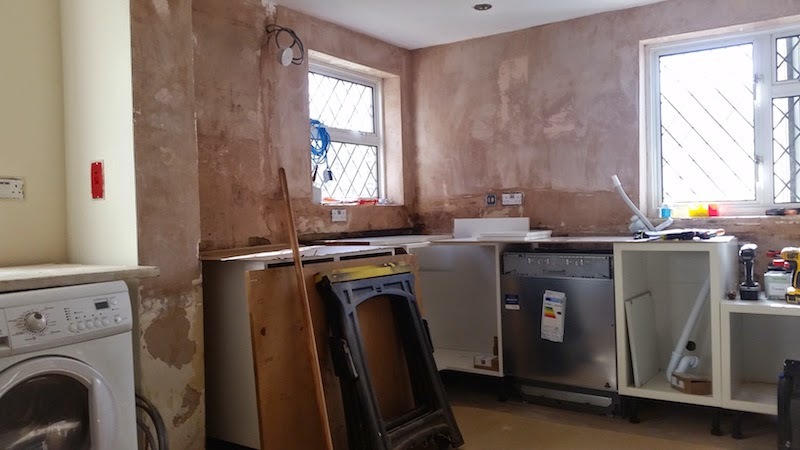 The walls are all plastered. I would have liked to have had everything painted fully but it was easy enough to do it before the worktops went in. Working my way around the room towards the "island". You can see here in the corner, I actually ended up removing ALL the cabinets on this back wall and lagging the new water pipes along the exterior wall. I noticed overnight that condensation had built up on the cold water pipes. Insulating them should stop moisture building up, and with it all closed in, drying might be an issue down the line, so I just took the precaution to stop it before it took hold. 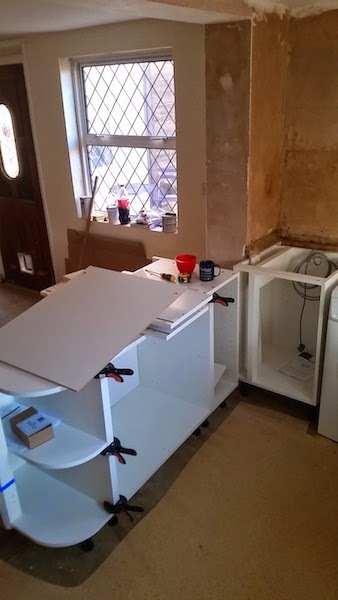 Also Having plastered the walls, I only skimmed down to just above the base units. This would be tiled over, so it was more a time saver than anything else. 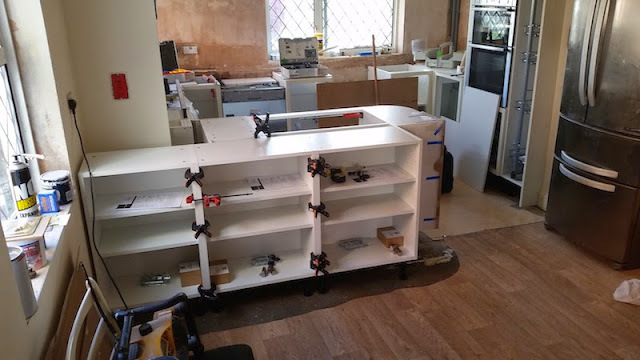 Here you can see the island taking form. 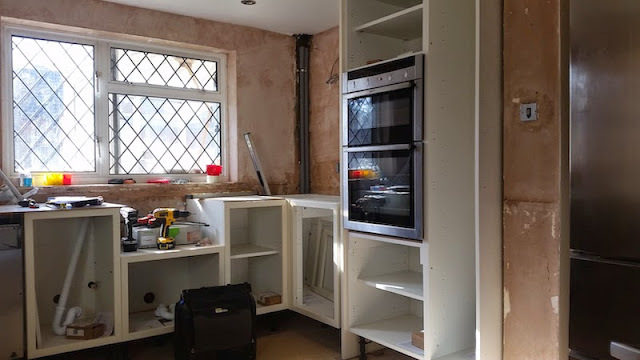 The skinny cupboard in the corner is actually an 800mm corner unit that had to be modified to fit up to the brick pier. Easier than I though it might be. It could have beed a much smaller unit with a void to the side, but I decided to modify the bigger one and make use of the cupboard space, just with the smaller door. The oven was reused, as it was less than 12 months old. Fitted like a glove, and the Electrician did a great job of doing all the wiring, nice and neat and tidy! The island taking shape. The shallower cabinets on this side are made up of wall cabinets mounted on the same plastic feet. 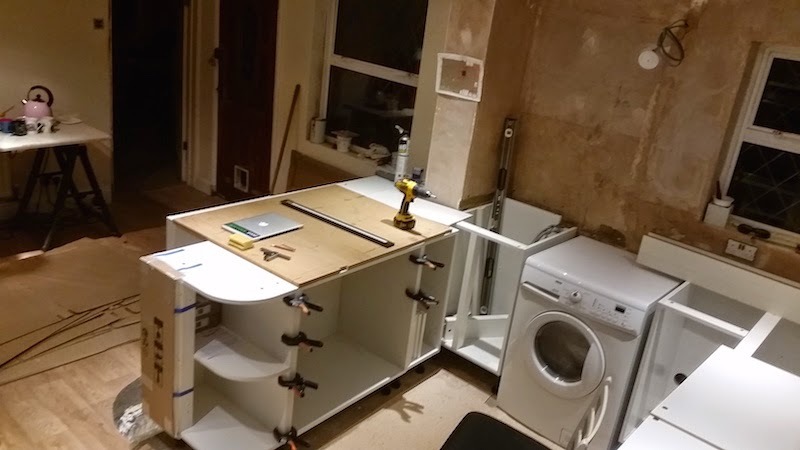 This gives a good depth without having to joint a second worktop. Island worktops come in 960mm widths rather than the standard 620mm for the other areas. The large cupboard will have drawers mounted below the hob. Note the cardboard taped to the end to protect the finished end panel. 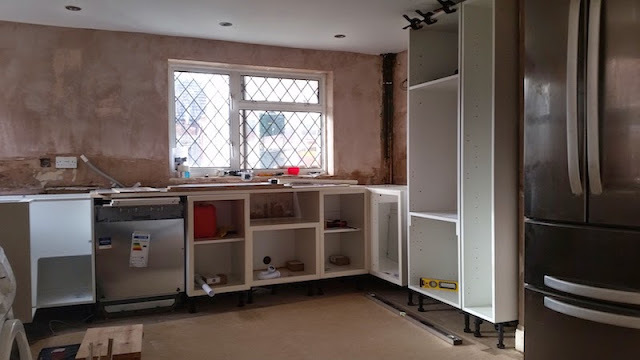 More cupboards! Because these are wall units, the back panels come with holes in them to adjust the fixings to the wall. I didn't want the holes visible, so I had to change these out - I'll show that next time! This is where I REALLY STARTED TO SWEAR! 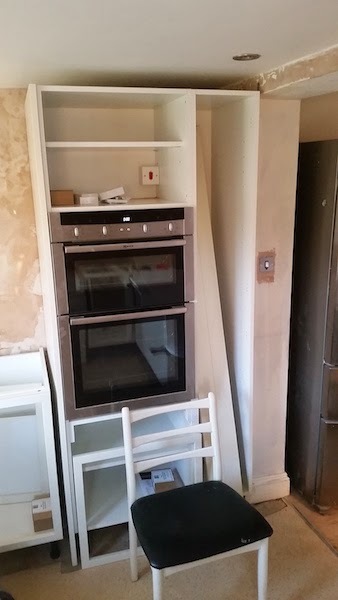 The cupboard under the cooker is a standard size, and so is the door. 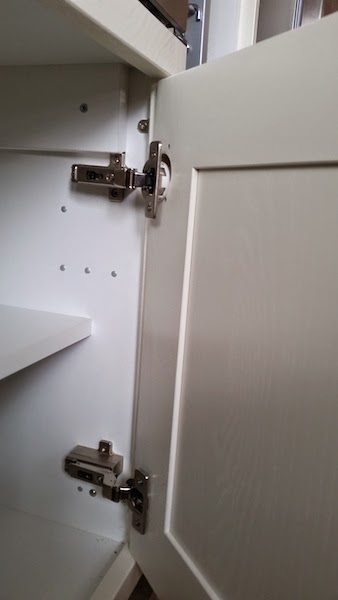 Although there is a bit of vertical adjustment (about 3mm) in the hinge mountings, the mortices in the door would not line up with the hinges. Here the top hinge is adjusted as high as it would go, and the bottom as far down! The door went back, and got replaced, but the replacement was the same! Then I really started to get the hump, but I fixed it down the line, so watch out for the next post about that too! Don't forget to sign up to get alerted each time a new post is published.